Most of us keep some kind of note-taking device close at hand in our offices — either a computer or some other electronic device, or some sort of paper. 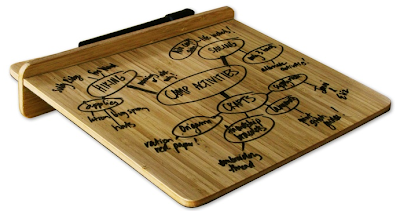 But there's another option: erasable tablets or boards, designed for the tabletop. And these same tools could also be used to keep a few critical bits of information front and center. 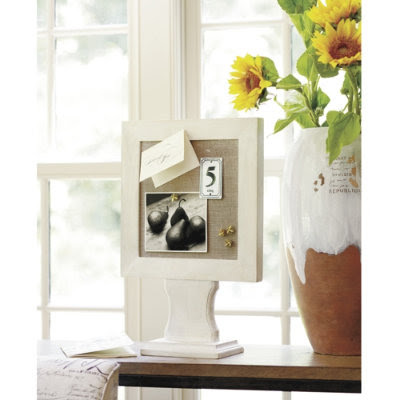 And a third ceramic option, this time a message board, comes from Gracious Goods and can be found on the Neiman Marcus and Horchow web sites — and through Iron Accents, too. Don't want ceramic? How about the desktop bamboo tablet (large) or to-do board (small) from Three by Three? And there's always the blackboard — again, in a tabletop or desktop size. 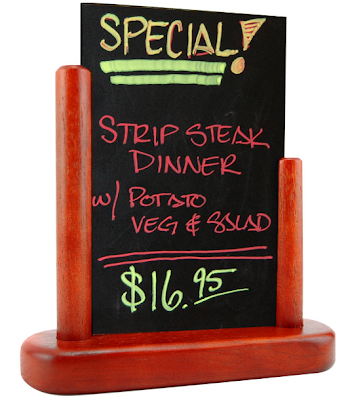 Restaurant supply vendors are a good source of tabletop message boards. Are you one of those people who needs to keep a few pieces of paper in front of you at all times — not files, but individual little notes? 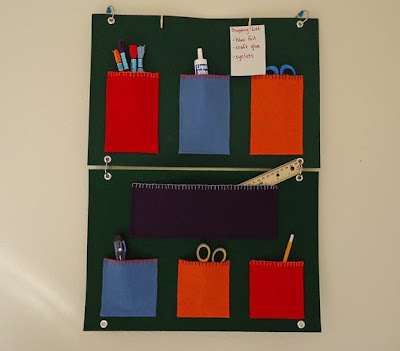 Is a wall-mounted bulletin board not going to work for you? The perhaps one of these desktop products will suit your needs. 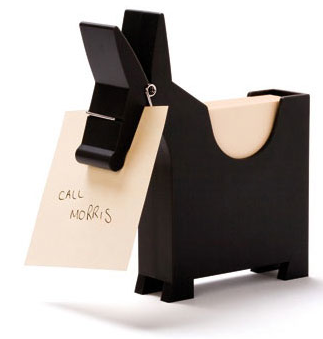 Let's start with the Morris memo holder, available in five colors and sold many places, including here and here. Oversized paper clip memo holders have been around for a while - but they don't usually look as beautiful as the hand-carved ones from DA Woodworks, which sells them on Etsy. Update on Dec. 12, 2012: DA Woodworks still has a store on Etsy, but doesn't seem to be active there any more. 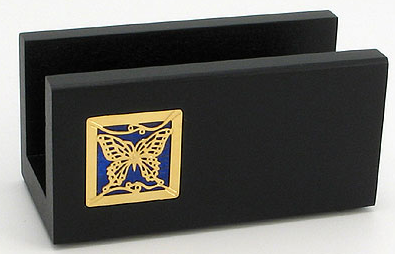 And then there are the clip-style holders. 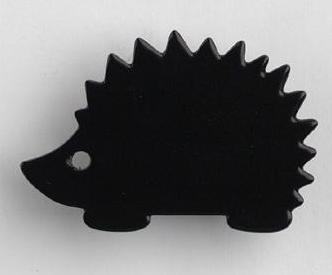 Some of them are sort of cheesy looking, but this pewter armadillo memo clip looks pretty wonderful. 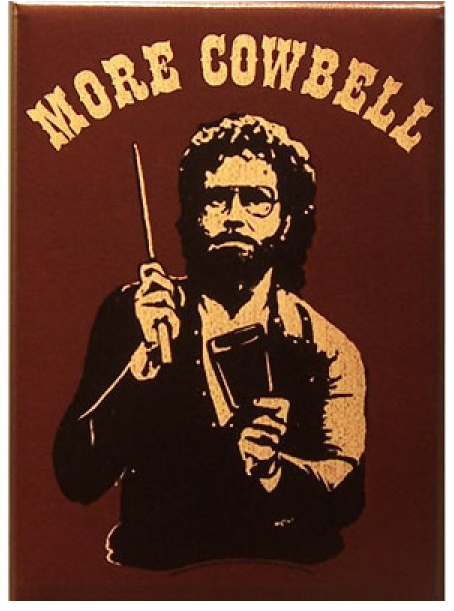 Update on Dec. 12, 2012: Sadly, I'm no longer finding this product. Magnetic Desk Dots are another idea — but not if you have small children around. 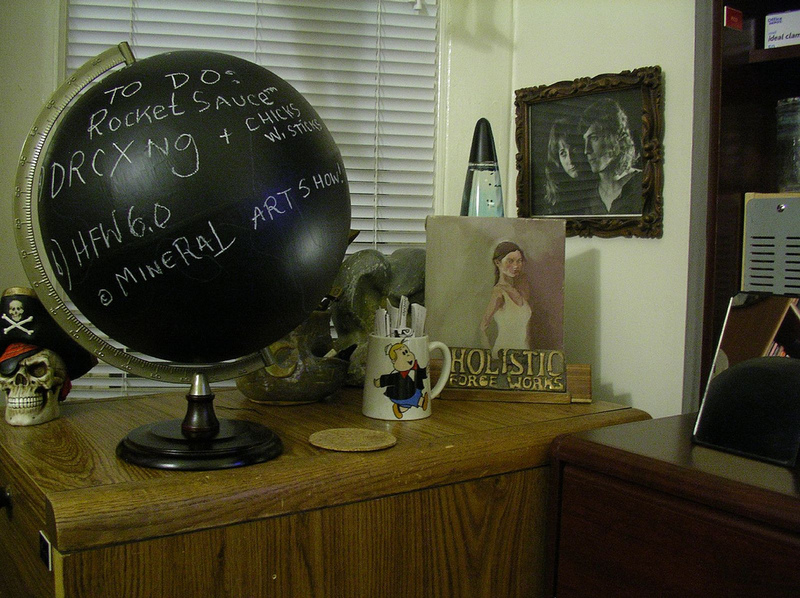 I found them through the always-interesting Uncommon Goods. Update on Dec. 12, 2012: This is a discontinued product — so if you want some, get them now while some vendors still have them in stock. 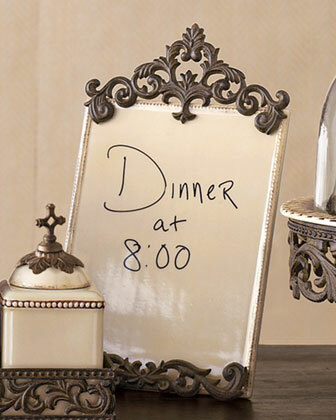 Ballard Designs has a tabletop message board. Update on Dec. 12, 2012: Ballard Designs no longer carrries this product. 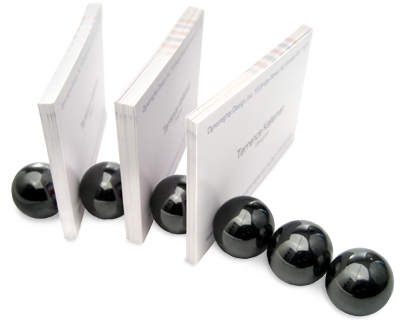 Desktop business card holders could also be used to hold other small pieces of paper. And for those with somewhat larger papers to keep handy, a repurposed toast rack — available in many styles — can work well, too. 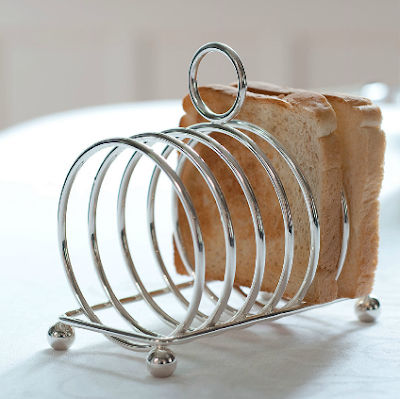 They don't have to be anywhere near as expensive as this lovely sterling silver toast rack. Scott Belsky is a compelling speaker. When I heard him at an organizing conference earlier this year, I was so impressed with him — and with what he had to say — that I briefly thought about trying to get a job at his company, Behance. That's an idea that didn't happen, for many reasons — but when I read through my notes from his talk a few days ago, I decided to get his book and learn more. 2. The forces of community. While all three sections have great ideas, I'm going to focus on just the first one: organization and execution. Sometimes this section reminded me of David Allen and his book, Getting Things Done — even the book titles have a similar ring. But there are plenty of differences, too. And some items reminded me of the things I learned in my corporate days. 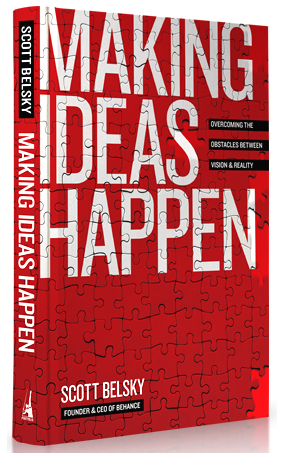 The way Belsky recommends we handle organization and execution is what he calls the Action Method, which "begins with the simple premise that everything is a project." A project could be the kinds of things you might think about: preparing a major presentation, for example, or doing your taxes. But there are also projects like "the stuff you do to advance your career" which become a "career development" project. And each project has three primary components: Action Steps, References, and Backburner Items. Action Steps are "the specific, concrete tasks that move you forward: redraft and send the memo, post the blog entry, pay the electricity bill, etc." We need a way to capture these anywhere they happen: at the office, surely, but also "when you are reading an article, taking a shower, daydreaming, or getting ready for bed." Each Action Step "must be owned by a single person" because "an unowned Action Step will never be taken." This was a familiar idea to me, but what was new to me was Belsky's insistence that we not have one person take notes of all the Action Steps agreed to in a meeting, and send them around. "Each person needs to 'own' their Action Steps," he says. "When tasks are written in your own handwriting, in your own idiom, they remain familiar and are more likely to be executed." He also notes that "Some teams take a few minutes at the end of every meeting to go around the table and allow each person to recite the Action Steps that he or she captured. Doing so will almost always reveal a missed Action Step or a duplication on two people's lists." Given that we're dealing with the Action Method, it's not surprising that Belsky says: "Taking and organizing extensive notes aren't worth the effort. We have found that notes are seldom used and can actually get in the way of capturing and following up on Action Steps." Which brings us to References — all those things you may want to refer back to that are not actionable: handouts, manuals, web sites, etc. Belsky says many of us were trained back in our early school years to write everything down, and now have well-developed habits of doing so — but that for many of us "this habit of recording and organizing everything has become a time- and space-consuming behavior with no real payoff." Furthermore, "the more energy you spend on scribbling down notes, the more liable you are to miss the opportunity to capture valuable Action Steps." 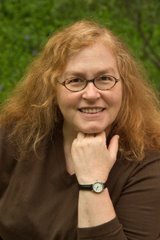 Belsky provides suggestions for easy ways to store the References we keep. But he says we should ask ourselves "For what purpose would I refer back to this at some point?" — and if we can't think of anything, there's no need to keep it. And then there are Backburner Items — the "things that are not actionable now but may be someday" — which reminded me of David Allen's someday/maybe list. Belsky mentions the need for a "Backburner ritual" to "periodically revisit and curate the Backburner as time goes on" and he suggests doing this monthly. Some items will become Action Steps, some will have become irrelevant and can be eliminated, and others will stay on the Backburner. Belsky also dives into prioritization, recommending that we place all our projects on an Energy Line "according to how much energy they should receive." His sample line has five categories: extreme, high, medium, low and idle. At first, there's often a tendency to put too many items on the extreme end of the line; doing this exercise may force us to make tough decisions. "Energy is a finite resource that is seldom managed well," Belsky says, and going through the Energy Line exercise can help. There's much more in this section, including many ideas about processing your email and the notes you take during the day, and many ideas about making the most of meetings. ("Most meetings are fruitless," he says.) 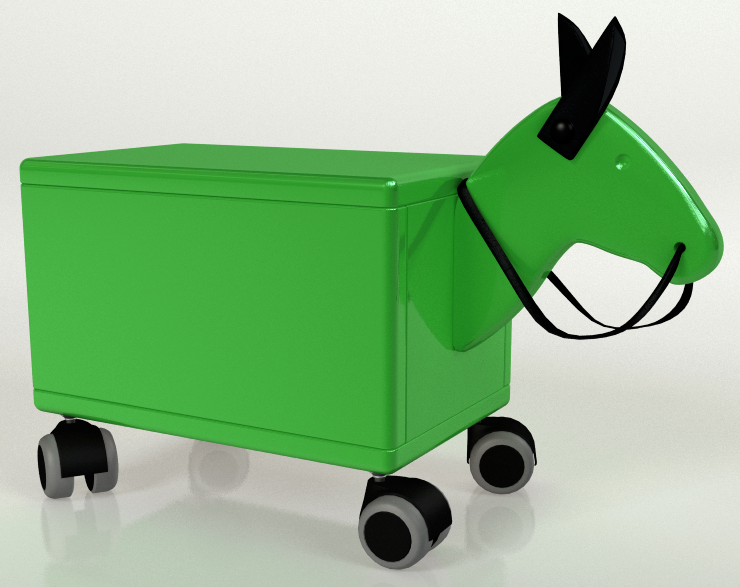 Belsky quotes Seth Godin on the importance of shipping — getting your product, whatever it might be, out the door — and Jesse Rothstein on the importance of follow-up. There's also a mention of the importance of selecting good tools; Belsky says, "The aesthetics of the tools you use to make ideas happen matter." As you can tell from how long I've nattered on here, I found a lot of worthwhile ideas in this book; I'm glad I read it. Now I need to go distill the Action Steps and Backburner Items I'm taking away from my reading; the book itself is my Reference, and it's one I'm going to keep. Don't want the hassle of running a yard sale? Looking for a good place to donate things you no longer need? 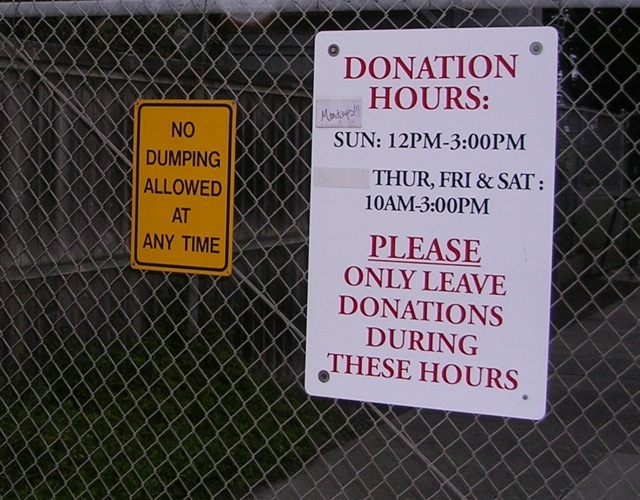 See if your community has a thrift shop that's used to fund local community programs. 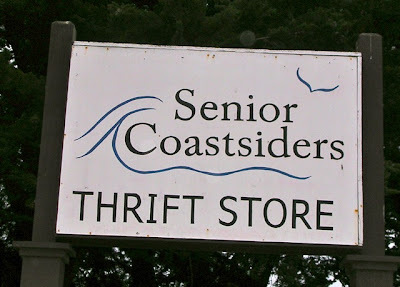 I just dropped off some of a client's items at the Senior Coastsiders Thrift Store in Half Moon Bay, and got a warm thank-you as well as a tax receipt for my client. The store provides 25-30% of the budget for Senior Coastsiders, which offers a wide range of valuable services. 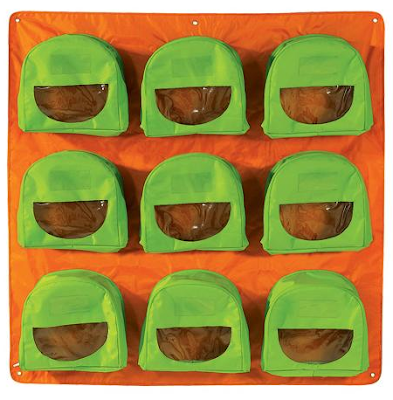 Some of the items donated don't meet the needs of the store, but very little goes to waste. Some of those items go to another non-profit thrift store further down the coast in Pescadero. And once a week, Goodwill sends over a truck to pick up a bunch of stuff; Goodwill certainly has more resources than my little local store for handling a wide range of donated items, and making sure as much as possible gets reused. Of course, you'll want to check with your thrift store to learn when it accepts donations, and what items it's prepared to take; my local store won't accept microwaves or televisions, for example. But there's a lot it does take, providing me an easy one-stop drop-off for clothes, jewelry, linens and much more. What Happens After You Donate that T-Shirt? I've long been a fan of David Allen's book, Getting Things Done. So when KQED's Forum ran an hour-long hour-long interview with Allen, I downloaded the podcast to my iPhone, and listened in the car. (Ignore the host calling this a "new book"; he was confused.) 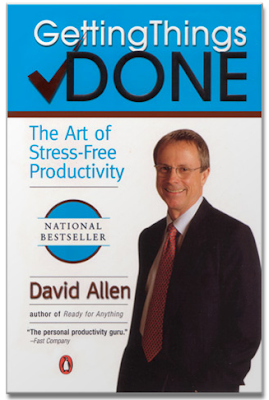 Allen covered many of the GTD basics, but he also had some ways of putting things that I hadn't heard before. I thought I'd share some of my favorite snippets. Allen talked about "the GSA of life — the Gnawing Sense of Anxiety — that somewhere out there I ... could/should/ought to be doing something, and it might be more important than whatever I'm currently doing; oh damn." His answer to avoiding GSA starts with having a written inventory — on paper, or electronically — of all our commitments. You need a list of what you've got to do that day ... that's what I call the hard landscape. ... But then all the other things, which actually happens to be the vast majority, is the "as soon as I can get to" list. ... So you look at the hard landscape and say, "OK, that's what I got to" and then if you have any discretionary time at all, then you have the list of all the other things to do — and by the way, most people have over 150 of those other things they need to do, if they actually sat down and had integrity about keeping track of the inventory. Isn't it easier to be in charge of your life if you're in charge of your company, or your organization, as opposed to being way down on the list and taking orders from the boss? Oh, well, we're all at effect of the weather and our bosses and a lot of other things, so we start with well, let's at least handle the 10 acres that you're in — make sure that's under control. I empty my in-basket and do regular reviews and keep all this current for the same reason I brush my teeth and take showers: If I don't, the scuzz factor gets too high. I like things small, black, high-tech and expensive. 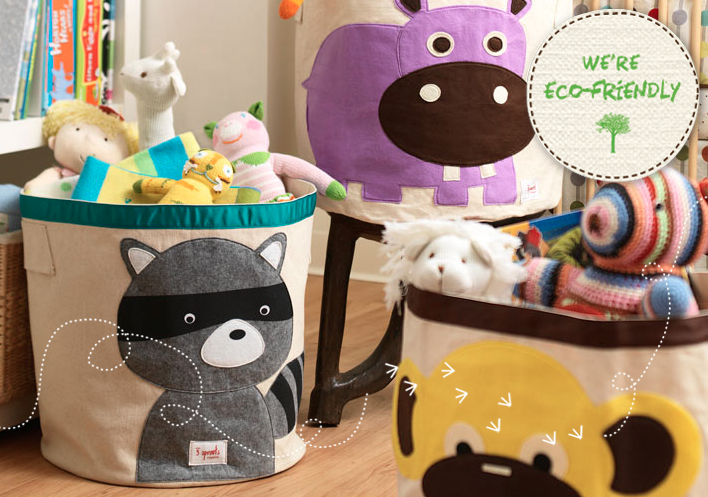 Let's start with the storage bins from 3 Sprouts — the same company that makes the cute wall-mounted organizers I mentioned recently. 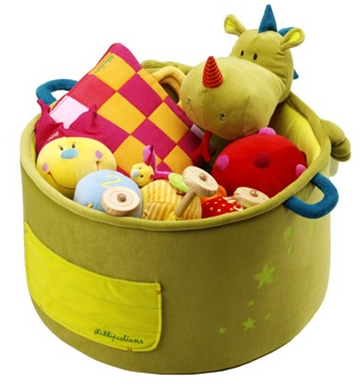 This toy basket comes from Lilliputiens in Belgium; you can buy it at Jolena. 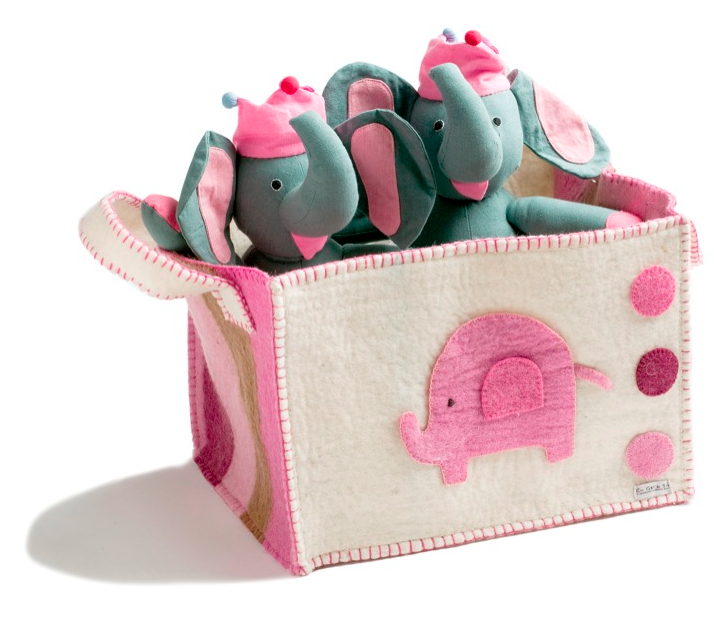 Én Gry & Sif makes toy baskets from felted wool; you can find them at Danish Bohemia. 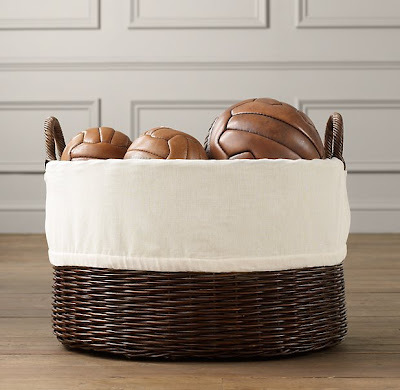 And for those in other parts of the world, I also found one basket at The Praying Mantis in New Zealand, and two at Elegant Roots in the U.S.
Another style of toy basket comes to us from Corban & Blair. 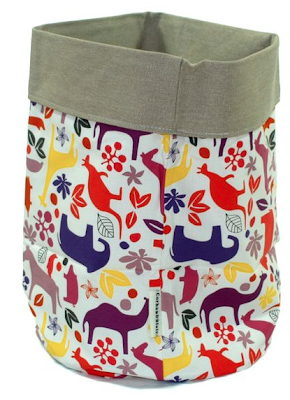 It's widely available in Australia, including at PVQ — and Corban & Blair does ship internationally. 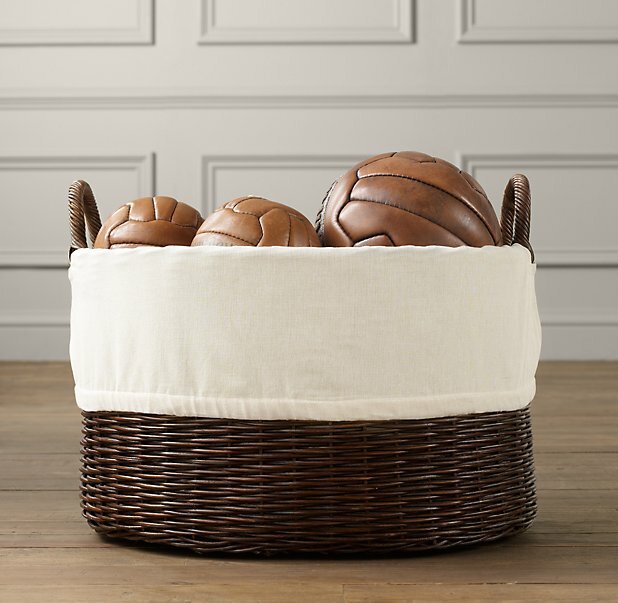 Restoration Hardware Baby and Child has a rattan toy basket, and liners for that basket. 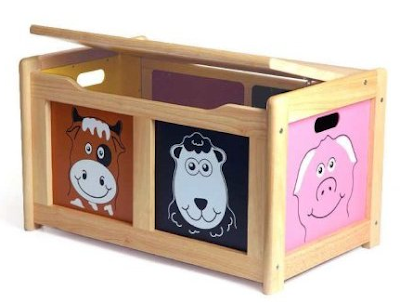 And finally, let's admire the personalized toy crates from Plantabox, available in your choice of eight colors. 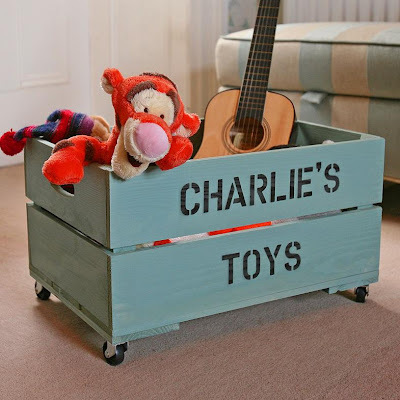 Big toy chests or boxes can get overused; they don't work well for small toys, or toys with small parts, since those small things get lost in a large box. 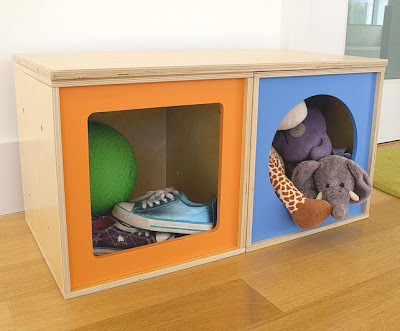 But they do have their uses for larger items — and some toy boxes are small enough to still be useful for smaller items. Let's look around, starting with the charming Leka Trojan Horse — a combination toy, stool and storage item. 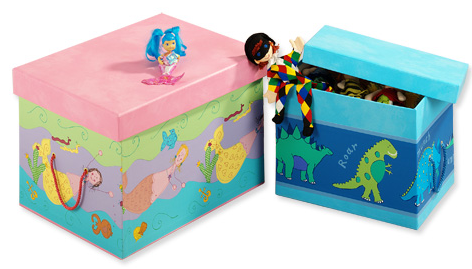 Leka suggests you use it for storing things like blocks. You can buy it here. The Empty Box Company sells toy boxes in two sizes and a huge range of designs. The toy boxes from Childs & Co come in three sizes and eight colors — and they use "a clever wooden hinge to stop little fingers being trapped." 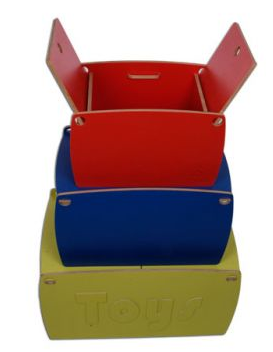 [via Baby Gadget] Update on Feb. 25, 2015: The toy boxes from Childs & Co now come with lids that lift off. For a more traditional toy box, take a look at those from Pintoy — available many places, including Amazon UK. And I've mentioned the modular ViaBoxes before — but it was a long time ago, and they deserve another look. I read a lot of other blogs. I'm subscribed to about 190 blogs, which publish about 500 posts/day. 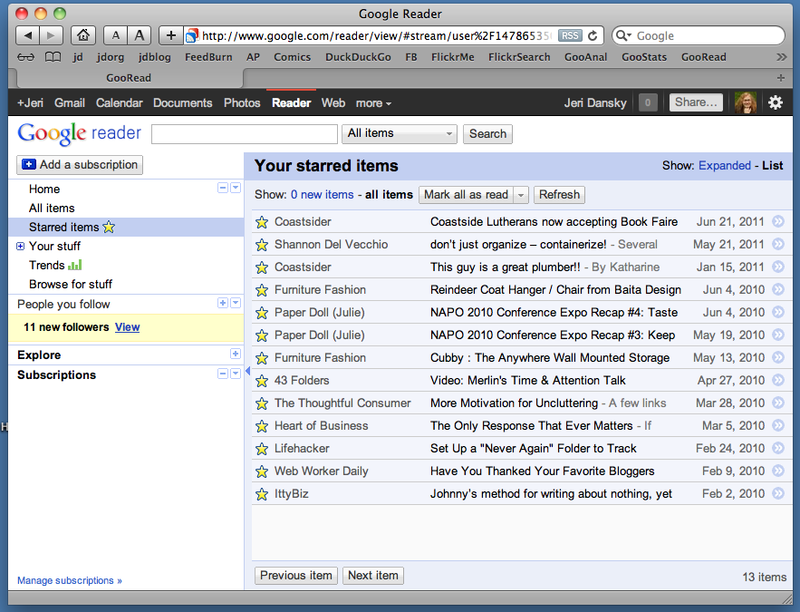 Fortunately, I use Google Reader, which makes it easy to skim through those posts and decide which ones I really want to read; I only read a very small percentage of those 500 daily posts! But sometimes I'll scan the posts and "star" those I want to read later, rather than reading them right away. And that's a fine strategy — except the number of starred items I had was approaching 950, which felt seriously out of control. So I had a project this past weekend to finally clear up my Reader. And, like any organizing project, this meant I was making decision after decision. Do I still want to read this item, or watch the associated video? Do I want to keep this post for future reference? And I found I hit the same kind of stumbling blocks we often find in other decluttering situations. 1. No clear "home" for something I want to keep. 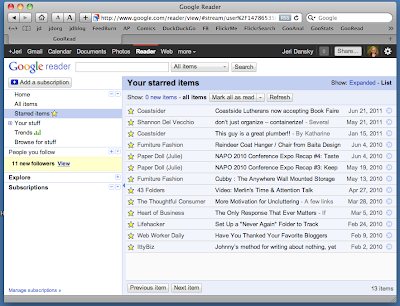 I "store" my posts in a big list of bookmarked sites, organized into many bookmark folders. And I found that many of the items that lingered in my "starred" list were things where I wasn't sure where to file the post — where my filing system for bookmarked sites wasn't working for me. So I did some reorganizing of my filing structure, until everything I wanted to keep had a logical home. 2. 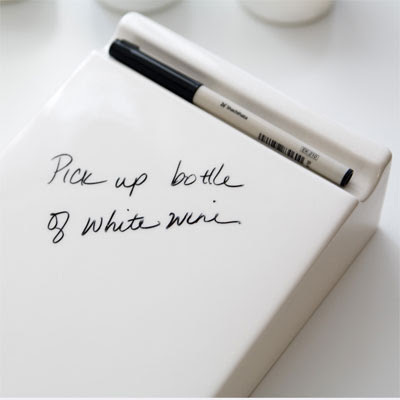 A tendency to let time-consuming items linger on my list forever. That might be a long post, or a pointer to a long video. I need to be sure to set aside time to read and watch these items — or let them go. When I see something neat on the web — whether it's an organizing-related product, some place I'd like to visit, or just something that makes me laugh — my first tendency is to bookmark it and file it away. But when am I really going to go back and look at that post about some Italian furniture that, while cool, isn't something I'm likely to blog about, or recommend to a client? That might be a really cute photo of Paul Krugman and his cats — but do I really need to keep it? And that might be interesting information — but could I easily find it again, if I ever really wanted it, just by using Google? I had to stop myself, over and over, from keeping stuff that I just don't need. But now I'm down to 13 starred items — and I'll get the count down to zero, except I wanted to take a break and write this post first. And I'm pretty darn pleased with myself! 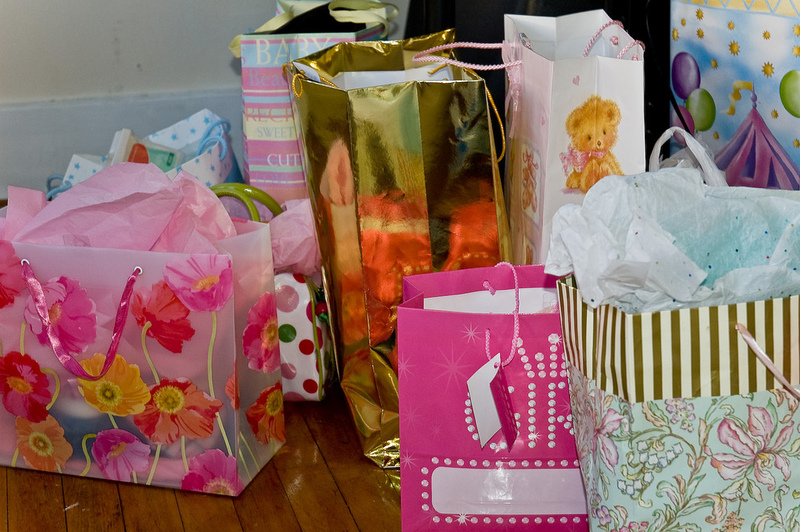 One way to be both personal and on target is to base a gift off the registry, and add a little something extra. ... If she registered for a coffee pot, get that, a set of filters, and a pound of artisanal coffee. But what do you do if you're the person creating the registry, and you don't really want the traditional household gifts? I've already mentioned charity registries like the I Do Foundation. But a bride-to-be was just asking me about registries, and I found some more appealing ideas. It's only in four cities right now, and the list of restaurants is a bit sparse in some — but I sure like the idea of registering for gift certificates from nice restaurants. I love this site, which lets you register for traditional gifts such as housewares — and enter a note explaining why you selected that item, as you can see in the sample wedding registry. But you can also list things like museum memberships or a state/national parks pass. Here are some other samples I've seen. From Jeremy and Jessica: Arts and Crafts. So many of my friends are such brilliant artists! I would really love a work of theirs, maybe a painting or a drawing or a framed photograph. From Jackie: Local wines, cheeses and other food items. From Heidi and Liz: Donations to favorite charities, and a subscription to the New York Times — and help with their upcoming move! And on the baby gift front, I love how Rebecca and Chris asked for bibs: "Handmade, hand-me-down, or new." Similarly, one of the items Katherine asked for was second-hand clothes. Another item on her list was "lunch or dinner the first few weeks." Have you given or received any non-traditional wedding or baby gifts? Feel free to share your experiences in the comments! 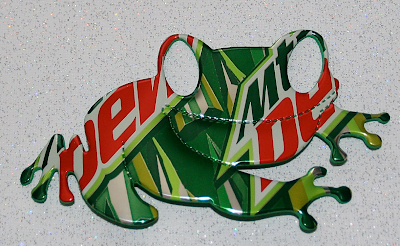 Does Your Refrigerator Door Need Some Cool Magnets? Where do you use magnets? 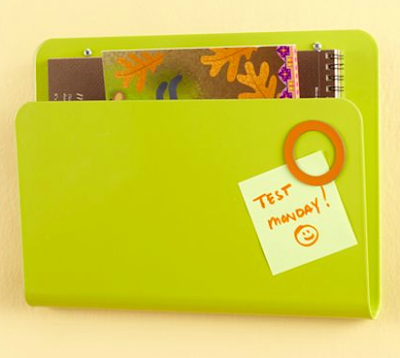 I'm a traditional refrigerator-door person myself, but some use magnetic boards or put their magnets on metal file cabinets — or any number of other metallic surfaces. And if you use magnets, wherever they go, they may as well be magnets you love. The one above is part of a marvelous collection of magnets made from recycled soda cans, sold by apmemory on Etsy. 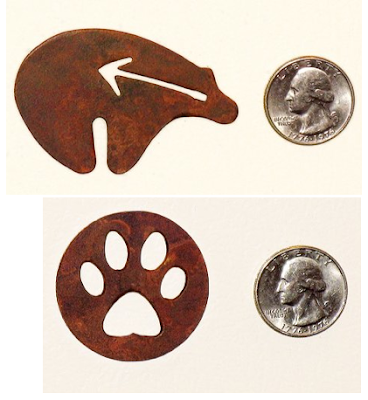 Boulder Pass Metalworks makes a variety of nice magnets from heavy-gauge steel, with a "natural rust finish that has been sealed." Fans of the Saturday Night Live "More Cowbell" skit — such as organizer Janine Adams — might like this magnet, available from the NBC Store and Patina. Update on June 24, 2014: I'm no longer finding this magnet. 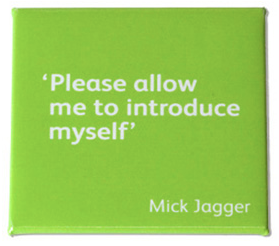 And for those with different musical tastes, here's another magnet, this time featuring Mick Jagger - found at the National Portrait Gallery web site. Not surprisingly, the gallery's store also has magnets with portraits. Update on June 24, 2014: I'm no longer finding this magnet. 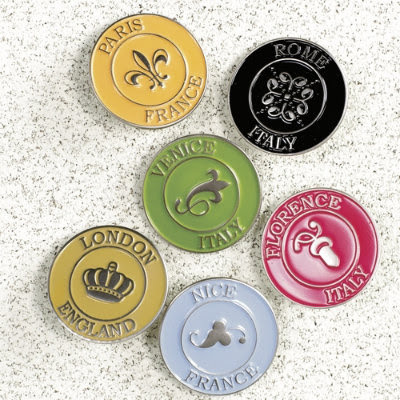 Ballard Designs provides us with this set of 12 city magnets. 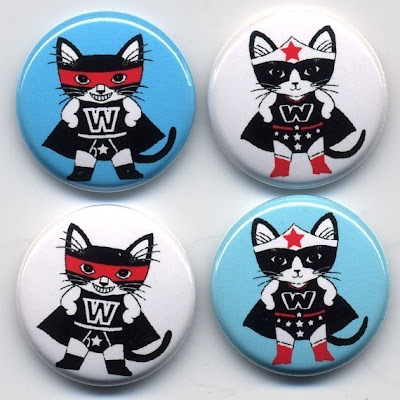 Update on June 24, 2014: Ballard Designs no longer has these magnets. 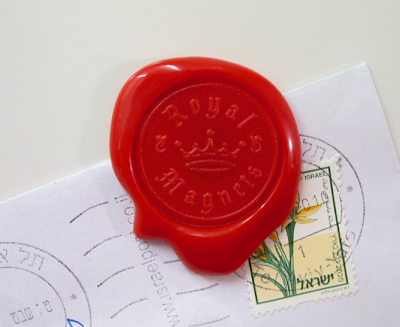 This royal magnet comes to us from Peleg Design in Israel; you can buy a set of three from Animi Causa. I found these "flag magnets" on a site called Not in the Malls. 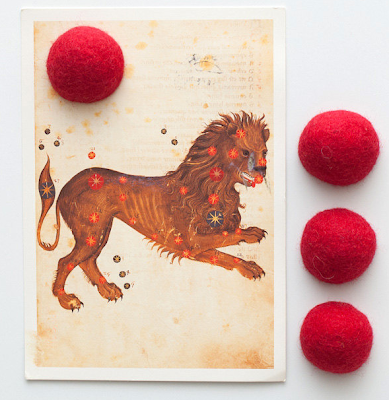 Pari Design provides pure wool magnets in some stunning colors - you can choose from 18 color options. Carolyn Graham of The Mosaic Garden makes magnets from "mini hand-painted ceramic tiles." 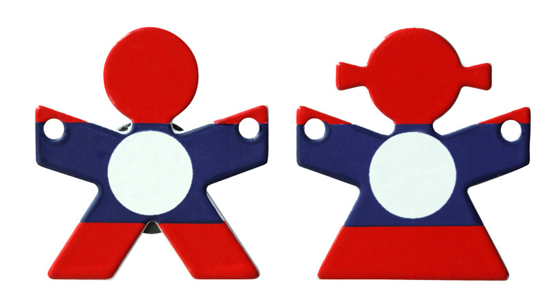 There's a wider range of products available on The Mosaic Garden's Folksy site, where you can find Carolyn's Union Jack magnets in a range of colors. 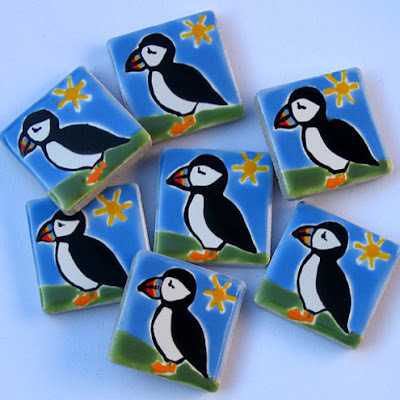 These puffin magnets are available on both sites. Finally, I'd like to re-acquaint you with the animal magnets from Papillon — which I've mentioned before, but not in a magnet-focused post. From the elk to the sheep to the hedgehog shown above, they're all wonderful. 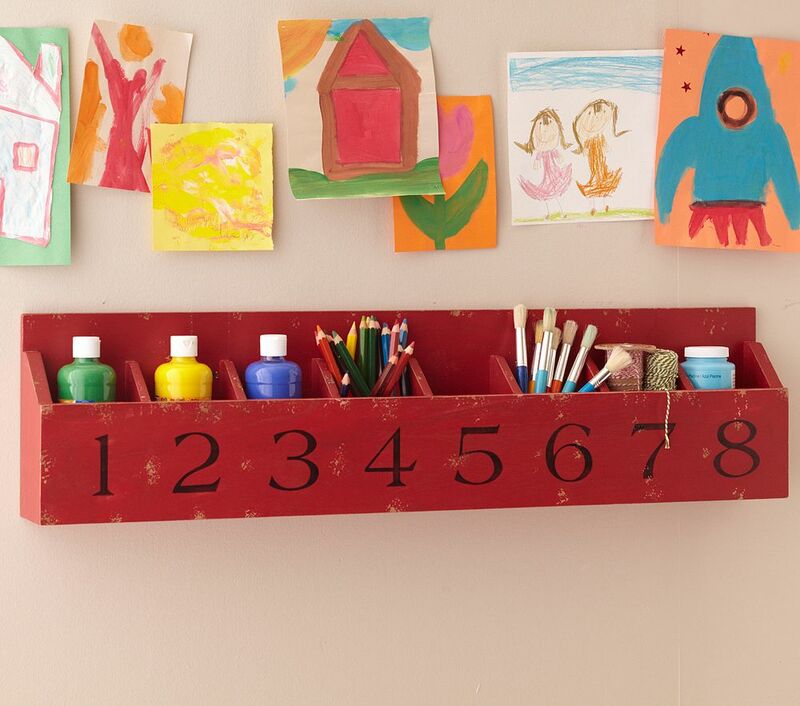 Since I last wrote about using the walls for storage — a whole day ago — I've found a bunch of new options! 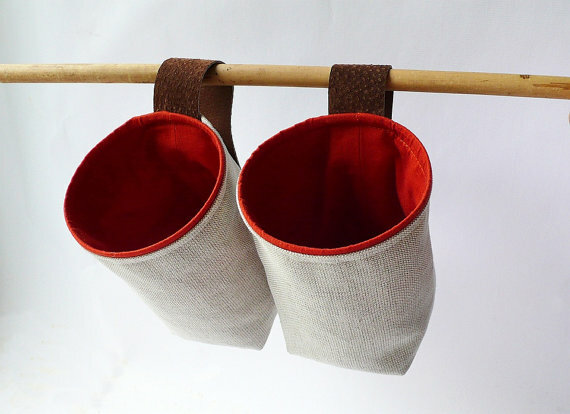 The hanging supply pocket organizer shown above comes from Unique Craft Creations on Etsy. It's made with felt, and you can order it with your choice of colors. 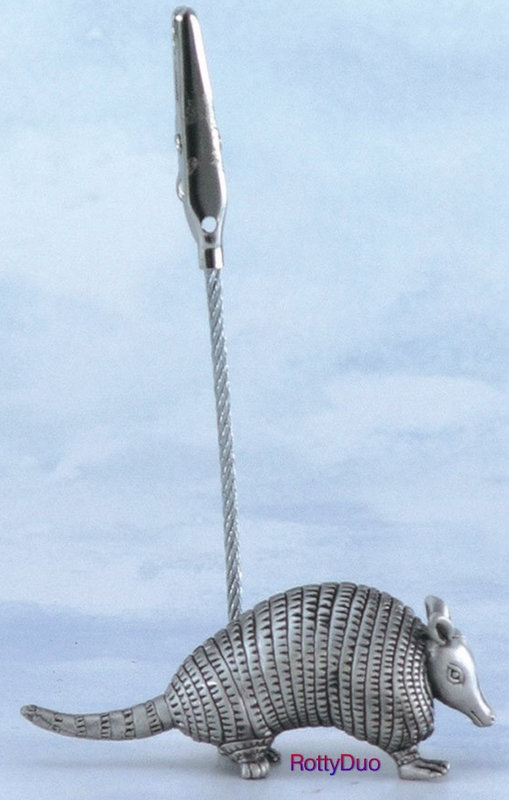 Update on Feb. 27, 2013: Unique Craft Creations no longer makes this product. 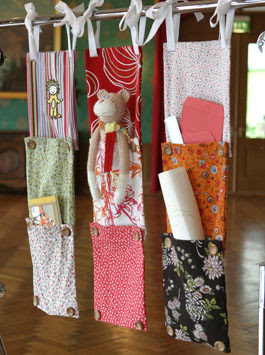 This is the football wall organizer from Lollipop Design, which makes a number of other designs, too. Update on Feb. 27, 2013: I'm no longer finding this product. 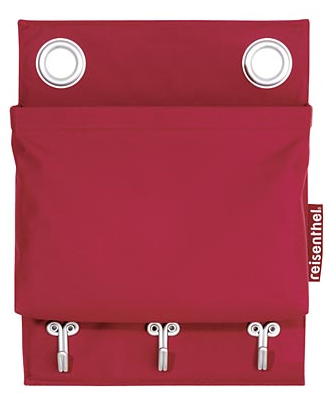 Wesco makes two styles of wall organizers: the Modulo series with zippered bags and the Visio series with bellows-style pockets. You can get them with three, six, nine or twelve pockets; sites selling them include Brodart and The Library Store. Update on Feb. 27, 2013: I'm no longer finding this product at The Library Store. Don't need so many pockets? Reisenthal has this Big Eye Singlepocket. It's widely available, and I've been pleased with the other Reisenthal products I've purchased in the past. Update on Feb. 27, 2013: Reisenthal doesn't seem to make this any more. 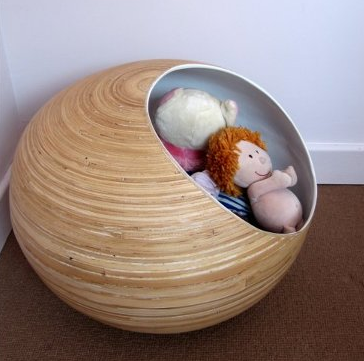 Now let's head over to Land of Nod for a different type of wall pocket. 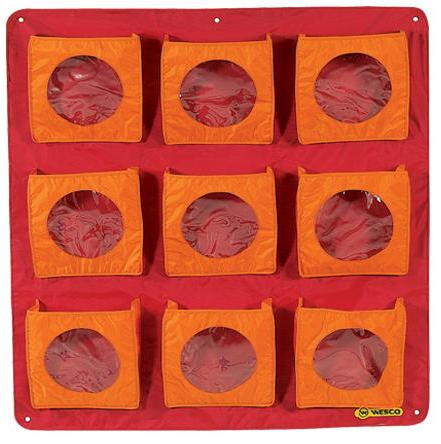 While the store calls these magnetic magazine pockets, they can obviously hold things other than magazines. It's available in red, silver and white in addition to green. And here's another type of wall storage: the number cubby shelf from Pottery Barn Kids. Update on Feb. 27, 2013: This product is no longer available. Pamela of Pamela Quilts takes salvages from her quilt-making and makes these buckets, which have loops to make it easy to hang them from the wall. 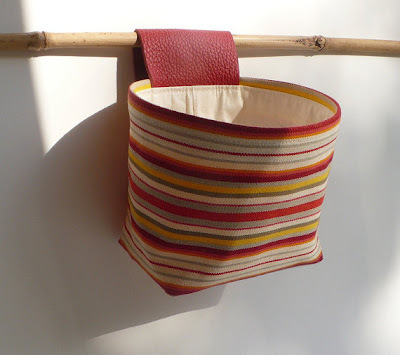 Klara of Granatina also makes fabric baskets you can mount on the wall. Through the wonders of Etsy, you can easily get her products, even though she lives in Budapest. 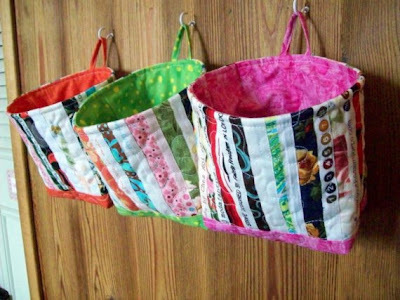 And for those of you with the do-it-yourself skills I lack, here are some instructions for making hanging fabric storage baskets.